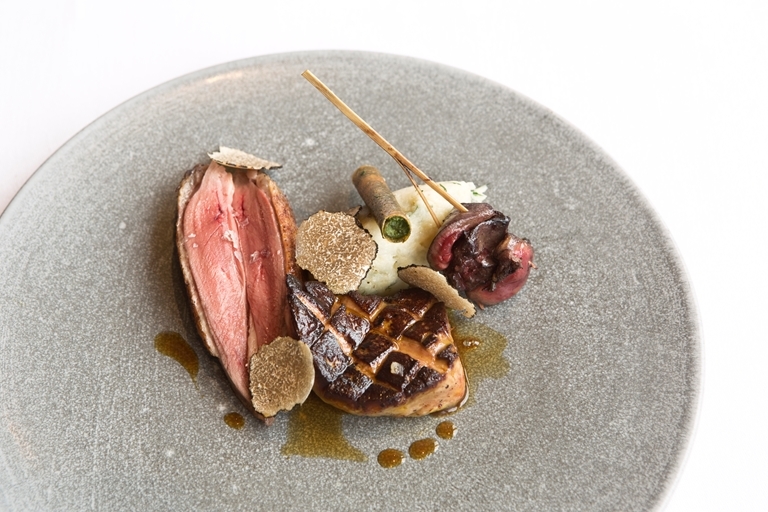 Despite being named after the Italian composer Gioachino Antonio Rossini, Rossini is traditionally a French dish and the foie gras and truffle sauce showcase some of the country's most highly prized ingredients. Adam Byatt offsets the richness of these with the juicy gaminess of the pigeon and salt-baked celeriac, making this a superb winter dinner party recipe. Meanwhile, prepare the pigeon. Remove the guts and place the heart and liver onto a skewer. Remove the legs, wishbone and undercarriage from the bird and discard, leaving the breasts.